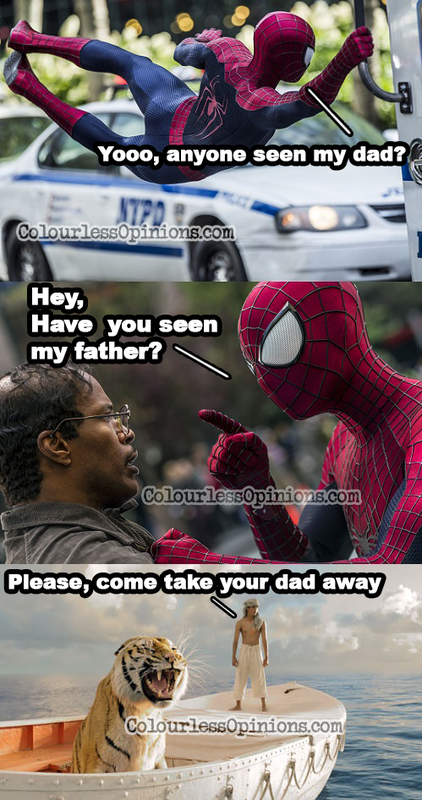 This second instalment of the titular superhero’s film franchise reboot takes place presumably a few months after the events of the 2012 film, where Peter Parker is now in a complicated relationship with Gwen Stacy while still fighting crime and protecting the city as his secret alter-ego, Spider-Man, struggling with visions of the last words of Gwen’s father, making him to promise to stay away from his daughter. New powerful villains arise, again from the misadventures in OsCorp, as Peter goes closer to the truth of the link between the organisation and his father, Richard Parker, who disappeared when he was still a child. First Marc Webb turned himself from being a music video director to now a film director. Now he’s turned Spider-Man into the new Superman and Batman. This is how Zack Snyder’s Man of Steel should’ve been – lengthy but amazingly funny, entertaining with not so over-the-top action sequences, and subtly about how the hero brings people hope (finally, the “with great power comes great responsibility” quote can be retired), while also portraying the whole let’s-be-together-let’s-not-let’s-do-okay-maybe-not love story between Peter Parker and Gwen Stacy without making it too annoying (I guess Webb’s quirky-dialogue style from 500 Days of Summer is working again). The story focuses mainly on the relationship between Peter Parker and Gwen Stacy more than the villains, so the level of emotional demand in acting is perhaps even higher than the first film, but fortunately, the cast delivered well. Andrew Garfield (The Social Network) continues his own unique portrayal of a more confident and expressive Peter Parker while Emma Stone still looking hot in those long boots playing the intelligent and brave girlfriend Gwen Stacy, both show great onscreen chemistry. Jamie Foxx (Django Unchained) does well as the socially awkward OsCorp employee Max Dillion who becomes from a Spider-Man fanatic to Electro, a villain that can absorb and control electricity. Dane DeHaan (Chronicles) could never fail to play a dark, evil character effectively, here he portrays a more urgent and hateful version of Harry Osborn, who of course, becomes the villain Green Goblin. Instead of just having Spider-Man beat the villains with after a few breath-taking, fast-paced wide-angle fight sequences, the story here also goes about how Peter Parker has to discover ways to stop them, and even absorbing tragedies of his personal life (if you’re familiar with the comics, you’d know what’s going to happen sooner or later… Sigh, why must there be Mary Jane Watson anyway). As a moderate fan, the only thing that really disappointed me was how it neglects and rushes the development of the Osborns (Norman Osborn does not become the Green Goblin first) and Rhino/Aleksei Sytsevich (played by Paul Giamatti) while also changing their origins. Now all baddies come from OsCorps’ experiments and high tech suits one way or another, and they’re after Peter and not so much the world. This franchise also does not spend too much time with the friendship between Peter Parker and Harry Osborn, but it’s fair and understandable when the intention was not to redo what was already been done so darn well previously in Sam Raimi’s version. But it is a little flawed in the end where [SPOILDER ALERT] Harry, despite hating Peter and knowing he’s Spider-Man, but he doesn’t expose it when he’s caught nor does he send his allies to go attack him at his home (or at least send more than one villain at a time to terrorise the city) [SPOILER ENDS]. And if their fight scenes against Spider-Man here could’ve been a little longer, it would’ve been even more pleasing. Nonetheless, the film is satisfying in overall despite being too predictable at times with its obvious foreshadowing. It’s emotionally engaging and it’s filled with hilarious trademark Spider-Man wit and sufficient web-swinging and shooting action (just maybe too quick against certain villains), done with CGI surprisingly more convincing than initially suggested in the trailers. 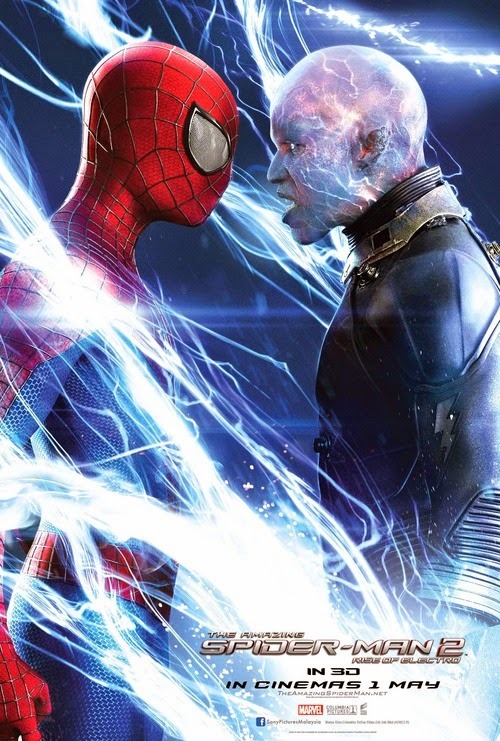 The Amazing Spider-Man 2 is simply the result of the first instalment that set this franchise reboot at the right path to produce great sequels, and this sequel’s ending, too, has paved way for even more epic sequels, now already with plans of doing 2 more films and 2 spinoffs involving the Sinister Six and my personal favourite, Venom. Spotting Stan Lee: His cameo is little too simple this time. He’s one of the parents at Peter and Gwen’s graduation at the beginning of the film, you won’t miss it as the camera focuses on him for a whole second. Censorship in Malaysia: Nothing seems to be cut at the special screening held at TGV 1 Utama. It’s a PG13 film after all. To watch in 3D? I watched it in 2D but I believe it’d look pretty awesome in IMAX 3D. Second opinion: My girlfriend enjoyed the film as well, saying that’s it’s very satisfying to watch while also giving high praises to the “detailed” CGI. Verdict: Lengthy, stuffed with too many villains it has not enough time for, but it’s fun to watch, highly entertaining and more importantly, proves that it has potential to always be better than a previous instalment. It also paves promising path for more epic sequels and I just can’t wait to see them. Special thanks to Klips Malaysia for the invitation to the special screening. I would say stay away from 3D. Not much worth to mentioned on the effects as they were very little to none at all. I love the emotional strings pulled by Marc Webb, especially the scene with Aunt May and Peter. *holds back manly tears* And 'that' character's death, I gasp loud. I knew 'that' person was gonna die but I still gasp. I thought you would give a lower rating 😛 haha I liked it too, pretty funny in fact. Em…not to over-the-top action sequences? Seriously? Well compared to Man of Steel, it really isn't too over the top. to be honest, i does not think this is an awesome movie. character development left much to be desired and about the issue of giving people hope, the plot was not played out very well too. well i does not think the rating is appropriate. firstly, the character development is much left to be desired. jamie foxx did managed to pull out a credible performance and the cast was decent but the story did not explore their characters further. about the issue of giving people hope i think it was played out pretty weak. the theme of questioning humans' value is really poor. True, it sacrificed a more thorough development of these villains, but not without purpose. It focuses more on Peter's tragic and justify his motivations, while also feature Green Goblin without going through the same thing as what Sam Raimi's version has already done so well, so lesser development for the Osborns is acceptable to me. 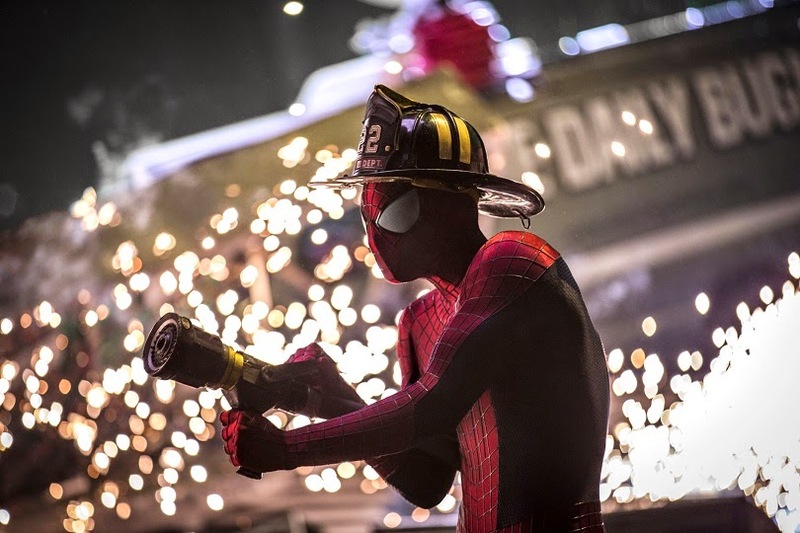 At the very least this sequel shows that director Marc Webb could continue to improve and has set up the future instalments to explore the more epic arc of the comics. CARNAGE! Did Man of Steel play out the theme of hope and human value well? No, but it doesn't matter anyway (although it should matter when Superman kills loads of people in that film) because come on, these are superhero films, the objective is to be fun and entertaining. Maybe the amazing The Dark Knight has spoiled some of us. 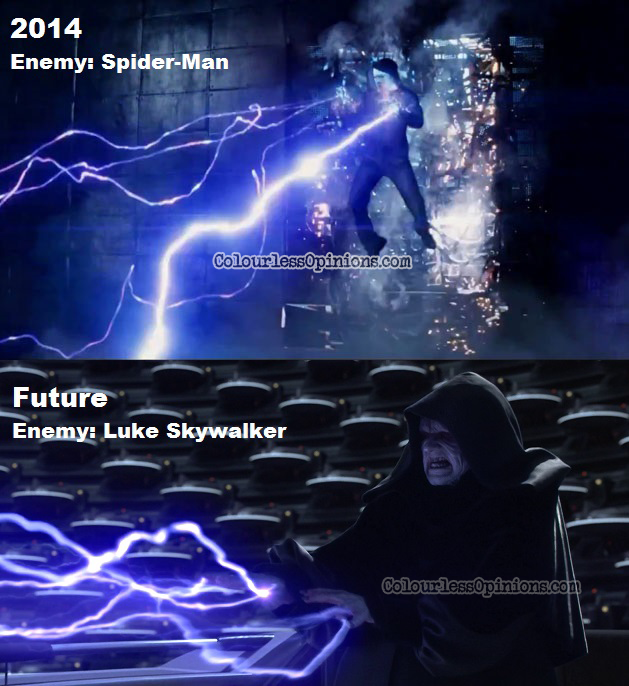 Future Enemy : Luke skywalker is hilarious!